سدیدخوی, احمد, سعیدنژاد, موسی‌الرضا, جوان دولوئی, غلام. (777). مدل‌سازی نگاشت انفجار در میدان نزدیک و بررسی پارامترهای مهم و مؤثر برآن. 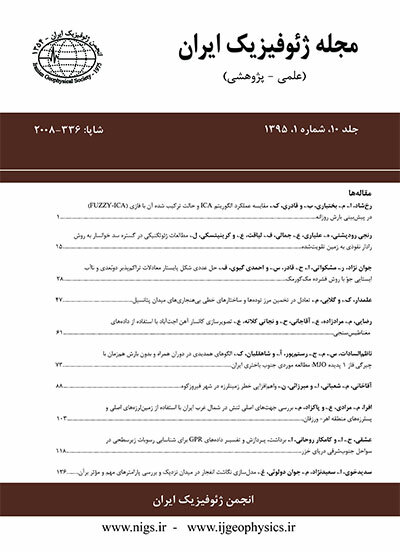 مجله ژئوفیزیک ایران, 10(1), 136-149. احمد سدیدخوی; موسی‌الرضا سعیدنژاد; غلام جوان دولوئی. "مدل‌سازی نگاشت انفجار در میدان نزدیک و بررسی پارامترهای مهم و مؤثر برآن". مجله ژئوفیزیک ایران, 10, 1, 777, 136-149. سدیدخوی, احمد, سعیدنژاد, موسی‌الرضا, جوان دولوئی, غلام. (777). 'مدل‌سازی نگاشت انفجار در میدان نزدیک و بررسی پارامترهای مهم و مؤثر برآن', مجله ژئوفیزیک ایران, 10(1), pp. 136-149. سدیدخوی, احمد, سعیدنژاد, موسی‌الرضا, جوان دولوئی, غلام. مدل‌سازی نگاشت انفجار در میدان نزدیک و بررسی پارامترهای مهم و مؤثر برآن. مجله ژئوفیزیک ایران, 777; 10(1): 136-149. 2- مقایسه بیشینه دامنه همبستگی نگاشت‌ها با یکدیگر. درنتیجه این مقایسه‌ها، چنانچه انحراف معیار بین 1تا 1/5بیانگر مدل‌سازی خوب، انحراف معیار بین 1/5تا 2بیانگر مدل‌سازی متوسط و انحراف معیار بیشتر از 2بیانگر مدل‌سازی ضعیف درنظرگرفته شوند، از نظر کیفی، 45% مدل‌های ساخته‌شده، تطابق خوب، 40% آن‌ها تطابق متوسط و 15% نگاشت‌ها تطابق ضعیفی با داده‌های واقعی داشته‌اند. For modeling the blast wave, its Green’s function must be solved first. Therefore, we use the Green’s function solution of explosive sources by Herman (1979). The study area was located around the gas pipes in high-speed rail project of Qom to Isfahan, from 50.5° E to 51.0°E and 33.5°N to 34.5°N. In this study, we used the four-digit seismograph machines of type CMG-6TD. The seismograph machines were arranged around the blast site in such a way that the threecomponent seismic energy radiation patterns of the blast were recorded in the vertical, radial and transverse directions. Further, a component (the radial component) was always placed in the site of the explosion. The distance between two consecutive samples was determined to be 10 milliseconds. The purpose of this arrangement of seismic machines has been to determine the blast radiation pattern and the impact of maximum velocity of the particles resulting from the explosion on a gas pipe. To study changes of the velocity model in output waveforms, three independent files are prepared, including the velocity model parameters of the region and the physical parameters of the source. We will generate three different outputs and select the output which is more consistent with the real waveform. The process is repeated by increasing and decreasing the source depth by 0.5 m and the amount of explosive materials by 0.5 kg (to impact the energy released). Finally, the best model of waveform, in terms of the closeness to reality, will be determined as a result. After obtaining the waveforms from the modeling and matching with real waveforms, to compare the accuracy of the model waveform with the real waveform the following methods were used. In the first method, with the calculation of the maximum normal correlation amplitude between the two series of models and real data, the difference of the resulting numbers from unity indicates which waveform is better and more accurate in modeling. In this method, the smaller the number is, the higher is the matching of that model with the real data. In the second method, the values of the natural logarithm (Ln) of each waveform and their differences are calculated. The positive difference of the standard deviation of the resulting values from one is considered as a measure of error. According to the second method, a high amount of epicentral distance leads to more consistency between models and real data. This results in blasts recorded from the station No. 4 to be clearly visible. Also, data from the station No. 2 in both methods show the lowest percentage of errors. The effects of the three factors of velocity model, the source depth and the energy of explosion were studied. The results obtained can be summarized as follows. For the velocity model, by decreasing the body wave velocities by 0.5 kms−1 , the correlation between the waves amplitudes diminishes in such a way that the model wave amplitudes increases with respect to the real wave amplitudes, and vice versa. For the source depth, the source depth alteration is directly related to the amplitudes of the vertical component of the waves, so that a 0.5 m increase in depth cause the amplitude to increase and decrease in depth causes the amplitude to decrease. To study the effect of the amount of the energy released on waveform modeling, having epicentral distance and maximum wave amplitudes, the equivalent magnitude can be calculated in local scale (ml) and by changing that, the released energy can be indirectly incorporated in modeling. امرا، م.، 1331، بررسی روش‌های پیش‌بینی لرزش ناشی از آتشباری: سمینار کارشناسی ارشد، پردیس دانشکده‌های فنی، دانشگاه تهران. اصانلو، م.، 1374، طراحی، برنامه‌ریزی و روش‌های استخراج معادن سطحی: انتشارات لادن. پورقاسمی، م.، 1379، شبیه‌سازی لرزش زمین ناشی از انفجار و بررسی اثرات تأخیر بر لرزش در معدن مس سرچشمه کرمان: پایان نامه کارشناسی ارشد، پردیس دانشکده‌های فنی، دانشگاه تهران. ریاحی، م. ع.، و سدیدخوی، ا.، 1390، مطالعات برآورد حداکثر وزن خرج مجاز در هر تأخیر به‌منظور انجام عملیات انفجاری ایمن در مجاورت لوله‌های فشارقوی گاز در مسیر راه‌آهن سریع‌السیر قم-اصفهان: گزارش فاز اول طرح پژوهشی، مؤسسه ژئوفیزیک، دانشگاه تهران. سعیدنژاد، م.، 1392، بررسی آسیب‌پذیری سازه‌ها و شریان‌های حیاتی با مدل‌سازی شکل موج انفجار: پایان‌نامه کارشناسی ارشد، مؤسسه ژئوفیزیک دانشگاه تهران. Arandelovic, D., 1969, Geophysical in Civil Engineering: Institute for Geological and Geophysical Research, Belgrade. Blair, D. P., and Jiang, J. J., 1995, Surface vibration due to a vertical column of explosive: Int. J. Rock Mech. Min. Sci. & Geomech., 32)2(, 149–154. Dong, W., and Schmitt, D. P., 1993, Dynamic and Static Green’s functions in transversely isotropic elastic media: Massachusetts Institute of Technology, 278 pp. Gutenberg, B., and Richter, C. F., 1956, Earthquake magnitude, intensity, energy, and acceleration: Bulletin of the Seismological Society of America, 46(2), 105–145. Herrman, R. B., 2006, An overview of synthetic seismogram computation: Saint Louis University. Herrmann, R. B., and Wang, C. Y., 1985, A comparison of synthetic seismograms: Bulletin of the Seismological Society of America, 75(1), 41–56. Lay, T., and Wallace, T. C., 1995, Modern Global Seismology, Academic Press, 521 pp. Mohiuddin, M. A., Korvin, G., Abdulraheem, A., and Khan, K., 2001, Attenuation characteristics of Saudi Arabian reservoir sandstone and limestone cores: 57th SCA (Society of Core Analysts). Singh, S. P., and Vogt, W., 1998, Effect of direction of initiation on ground vibration: Int. J. Surface Mining Reclamation and Environment, 12, 75–78. Udias, A., 1999, Principles of Seismology: Cambridge University Press, 492 pp.